Mike Schmidt's power at the plate as well as his ability to snag anything hit in his direction on the hot corner, made him arguably the best player to ever man third base. His 18 seasons with the Philadelphia Phillies bolsters his reputation as the ultimate fan favorite and he is the record holder in just about every key batting statistic for the team. 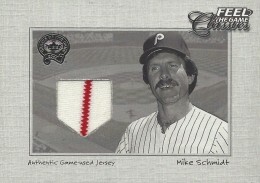 This top list dissects the best Mike Schmidt baseball cards from throughout his career. Shop for Professionally Graded Mike Schmidt Cards on eBay. One word that could describe Schmidt's career would certainly be "consistency." To go along with his 12 All-Star team selections, he was an eight-time National League home run leader and four-time RBI leader. He ended his career with 548 home runs and 1595 RBIs, which still stand as Phillies team records. While there had been power-hitting third basemen before, Schmidt was unique in combining that with outstanding defense. He won the Gold Glove Award ten times over his career and nine consecutive times from 1976 to 1984. 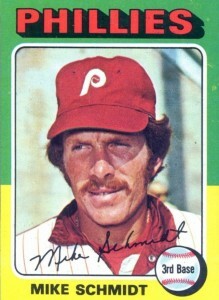 Schmidt won his first Most Valuable Player Award during the 1980 season. He would repeat as MVP the following season and added a third in 1986. Mike is also one of the few players to have ever hit four home runs in a game, which he did in 1976. Schmidt's legendary power came alive in the 1980 World Series against the Kansas City Royals that saw him smack two home runs and drive in seven runs on his way to winning World Series MVP. All these accolades translated into Schmidt being elected into the Hall of Fame in 1995 on the first ballot. Some other great-looking Mike Schmidt cards that didn't quite make the list include his appearances in 1981 Topps and 1982 Fleer. In the 1981 Fleer and 1982 Doruss sets you can find cards that feature Mike with teammate Pete Rose. The 1981 Fleer card with Rose also has a variation which features no number on the back. 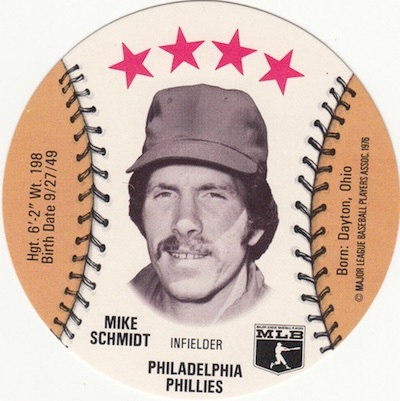 To celebrate a decade with the Phillies, card maker Star produced a 15-card set in 1983 that covered Schmidt's accomplishments with the team to that point. While he has plenty of signed cardboard, one of the most famous Mike Schmidt autographs can be pulled from packs of the 1991 Classic Best minor league set. 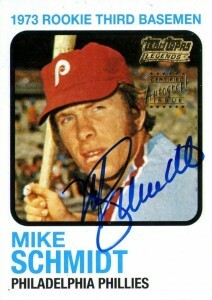 As he had recently retired, Schmidt was given the #1 spot on the checklist and 2,100 versions of that card were autographed. Although that seems like an incredibly high number, during the era of overproduction it translated into finding a Schmidt autograph at a rate of just one in every 8,000 packs. Schmidt's career spans through nearly two decades and the baseball card world changed greatly during that time. Toward the end of his playing career, trading cards were greatly overproduced and their value has been hurt because of it. In creating this top list, card value was used as the main component and weighted along with card design and desirability to identify the best of the best. These discs, put out by Michael Schechter Associates (MSA), were designed to include a logo or advertisement for a business on the reverse side. This means collectors can track down many different variations of the round cards. Discs featuring Schmidt on the front could include logos for companies like Crane Potato Chips, Isaly's Dairy products, or Orbaker's Quality Food. Blank-back versions are also available. Collectors will likely notice that team logos were removed from the photos as MSA only received a license from the MLB Player's Association. The 1975 Hostess All-Star cards came three cards to a box and Schmidt was paired with New York Yankees pitcher Sparky Lyle and Pittsburgh Pirates legend Willie Stargell on the same panel. The oddball set was the first issued by Hostess and they ended up producing five yearly sets. In total, 150 cards made up 50 panels that were spread across the many different products from Hostess. Uncut panels hold much more value than the individually separated cards. 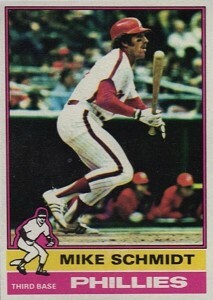 Like his card in 1976 Topps (check out #5 on this list), the pose on his 1977 Topps card features Schmidt holding the bat in a non-traditional manner in which he seems to be batting, but is looking right at the camera. He is also featured on a second card in the 1977 set as Schmidt led the National League in home runs in 1976 and shares a leaders card with Yankees slugger Graig Nettles. 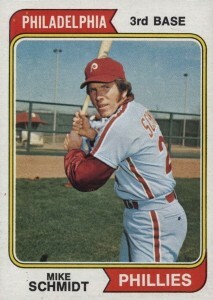 One of the earliest non-Topps cards to feature Schmidt was included in the 1975 Kellogg's 3-D Super Stars set. The checklist for this set was slightly larger than previous releases at 57 cards and collectors could request the cards through a mail-order offer along with pulling them from boxes of cereal. Collectors have found over time that the cards from 1975 have some of the lowest print runs of all 14 Kellogg's sets. While Schmidt continues to be featured in high-end product checklists like 2015 Topps Tier One and 2015 Panini National Treasures, those cards are typically short-printed and are closer to being case hits than a card that is commonly pulled. Fans who are collecting on a budget would be wise to look for a Schmidt jersey or bat relic, which are much more commonly available. A nice example can be found in 2001 Fleer Greats of the Game Classics. The design offers a black-and-white card that allows the red stripe of the Phillies jersey to really stand out. While the Mike Schmidt Topps cards up to this point had all featured staged photographs, his 1976 Topps card brings an action shot to the party with Mike in an odd position for a right-handed batter. Was it a check swing or, even more unlikely, was he squaring around to bunt? With his eyes glued to the pitcher, the image almost looks like he is about to charge the mound. 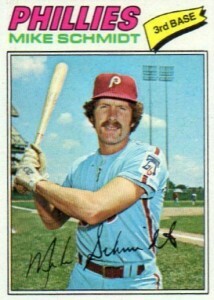 Schmidt's 1975 Topps card is my personal favorite as it features his famous mustache for the first time on a Topps card. The card highlights his earliest All-Star season and he led the league in home runs with 36. The reverse side also gives us the tidbit that Schmidt was the first to hit the roof of the Houston Astrodome with a swing of his bat. Collectors who are interested in tracking down a Mike Schmidt rookie card from 1973 Topps can actually find an autographed card using the same design at a more budget-friendly price. The 2002 Topps Team Legends set cut out the other players featured on Schmidt's multi-player first card, added some gold stamping, and topped it off with an on-card autograph. 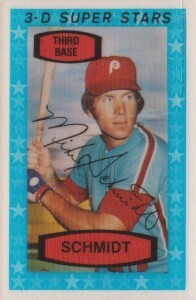 Schmidt's autograph is notable for his oversized "S" that is often written over the top of his first name. Schmidt's first year in the league would prove to be a microcosm of the rest of his career, with impressive power but a lower batting average. He slugged 18 home runs with 52 RBIs in his rookie year but was only able to notch a .196 average. The backs of the cards in the 1974 Topps set feature a cartoon with a fact about the player featured. Mike's cards lets fans know the very exciting news that he "enjoys listening to music." 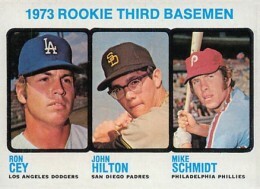 The only Mike Schmidt rookie card can be found in 1973 Topps along with John Hilton and future All-Star Ron Cey. Cey would even go on to be named the National League's Rookie of the Year in 1973. As such, Cey was certainly considered to be the leading prospect featured upon release. Schmidt, however, would end up with 200 more home runs than Cey and was a first-ballot Hall of Famer as well. Near-mint graded copies frequently top $800 with mint copies running several thousand at auction.